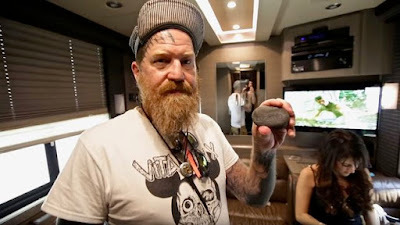 Following the opening clip of Troy Sanders on the road, the latest footage features guitarist Brent Hinds giving fans an inside look at the Atlanta group’s tour bus. Recorded with producer Brendan O’Brien, “Emperor Of Sand” debuted at No. 7 on the Billboard 200. The video series arrives in sync with this week’s launch of Mastodon’s 5-week tour of the UK and Europe. The trek marks the full-time return to live action by the band after cancelling a fall North American tour while longtime manager, Nick John, was undergoing treatment for pancreatic cancer before his passing in early September. Following the group’s loss, promoters for the European shows will make a donation to three charities on behalf of John, including The TJ Martel Foundation, Hirshberg Foundation For Pancreatic Cancer Research and the Pancreatic Cancer Action Network.